SARUNI JUDI of Kapar was suggesting that Najib Razak and Mahathir Mohamad meet in Makkah to sort out their mess. Good luck, Datuk, but I don't think Dr Mahathir wants to know. In fact, he has just stepped up his attack on the PM with The 1MDB Story. This latest posting traces the history of the 1MDB to its TIA days when the Sultan of Terengganu was the King. Very little in terms of new materials, mainly rehash of old questions and assumptions on the affairs of 1MDB. Still, it serves to keep the pressure on the PM-1MDB and ensures there is always ammo for the pro-Tun "camp". Clearly, Dr M is not in no mood for reconciliation or compromise. He is not even interested anymore in Najib's answers to his questions, as Salleh Syed Keruak points out, Dr M just wants Najib to resign or be removed as PM [Why "Ambush" PM when asnwers not wanted, Syed asks Dr M]. Since his posting titled simply 1MDB (13/3/15) Dr M has published more than 20 articles critical of 1MDB and the PM. Half of those articles were posted in the last 30 days. 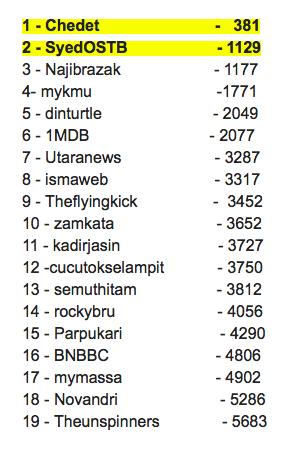 No wonder that Dr M's blog is back to the top of Alexa ranking for Malaysian socio-political blogs (h e r e). "Politically the PM and his fewer and fewer hangers on are losing out. People read Tun Dr Mahathir's Blog etc to find out the truth of what is going on. I can understand why Syed Akbar Ali is crowing (his blog is ranked No 2 behind Dr M's and ahead of Najib Razak's blog at No 3). 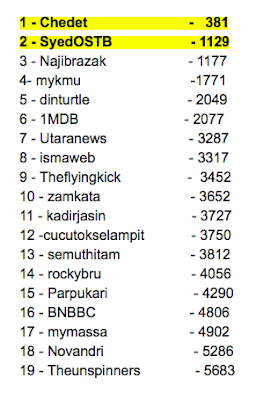 But the fact that some of Najib's "hangers on" are even at the top bracket of the Alexa ranking suggests also another important point: that blog readers ie Malaysians are taking the trouble to read Najib's defence, his side of the story. They are not as gullible as they used to be. They might even be wiser now. In view of this, Najib's advisors may want to encourage the PM to consider using his blog to respond directly and swiftly (preferably within 60 minutes) to chedet.cc each and every time Dr Mahathir publishes a new posting. Don't mind the attack blogs, such as OutSyed The Box, Kadir Jasin and Zam (all of whom are highly ranked in Alexa now), just take on the Old Man, one on one online. Respond to every line, if you have to. This way, I believe Najib can help contain the main "spat" to just between him and his ex-Boss, minus the "devils to clout their judgement". The NGOs and others who want answers can get all of that from the PM's blog, direct and without spin. The rest of us can sit back and read and learn and, hopefully, be able to decide for ourselves, aided by findings of the Auditor-General and the bipartisan PAC, on what's fact and what's fallacy. Please do not blame other bloggers. Blame it on najib. Time to unsubscribe rocky bru blog...just like I did with the other pro najib blogs. I am wiser now. I choose blog with common sense and leave blog full of craps. well all is good. except tht they dont know wht to answer because the alleg. are true. thts why theyve been beating around the bush and never give a clear cut answer. id like to see how they try though, tackle the issue one by one, point by point, tht is if after all they gonna answer it, and not pretend its another question and then give a different answer. Saruni Judi stop bedeviling our thinking. This 1MDB is a financial fiasco, it's not a win-lose political tussle between two men. Would you provide passage to Mecca for all the Malaysians who are unnerved by Najib's ministerial belligerence, where no devils like you may clout our judgement? When are the police investigations commencing? You have lost the pulse of the ordinary man. When RM42 bilion is at stake, the fence-sitters will dump your blog as it serves no purpose. Fence-sitters WILL read Chedet and OSTB because they stick to facts and take the bull by the horns. Why do you want to defend Najib in advising him to counter all the allegations. He simply CANNOT because he is also NOT in the know you know. Someone else is usurping his power in the name of ADVERTISED love for him. Between you and Nazir Razak, we side with kangkung's brother as he is a BANKER and he knows a lot more than you about Najib's family. The problem with Najib he did not provide any clear answer or explanation on questions posted by Tun M on 1MDB. For example Najib never explained who Jho Low is (to him especially) Najib is only good at "berputar belit"
The expression is "cloud", not "clout”, but far more importantly, the actual points raised by Dr M have never been rebutted fully or properly. Read the perceptive JMD blog for a more detailed take. He demolishes the (expensive) pro-Najib spin very well. Don't read Helen Ang or ISMA though, whose "evangelist" hysteria is getting quite laughable. It's really patronising to Muslims to assume they are so easily swayed. Now, do you feel the overwhelming urge to become a grotesquely fat, ugly Chinese woman? People can decide for themselves, you see. First of all, the various technicalities of the deals of 1MDB's finance is beyond me. For one thing, I can be sure I would never in my lifetime be involved with loans and deals with billions of ringgit at stake. All I can say is that the way 1MDB do business looks shady to me, the people explaining it have been called out by their critics many times, 1MDB ways of explaining are not good enough to give a good perception to even foreign banks who started asking for their money back, and I'm disgusted by the way Najib's side chose to attack Dr Mahathir. Oh, also that darah bugis and nothing to hide is just great setup for the Friday farce last week. Don't bother spinning that. So I earnestly believe that there's something seriously wrong with 1MDB that will be devastating to this country and cause economic trouble for a lot of Malaysians. I also believe that Dr Mahathir, while having the same belief as stated, and trying to convince the country of it and intimidate Najib into stepping down, simply don't have any proof. If he has, he would have used it by now. Therefore, if Najib or anyone using Najib is guilty of 1MDB misconduct, there won't be any chance of bringing them to justice, until after damage is irreversibly done. This is because of the nature of Malaysian government, with excessive power in PM's hands, Dr Mahathir is guilty of making it so. As example, Dr Mahathir have been informed of Anwar's sexual behaviour, yet chose either not to believe it or keep it secret for years, and the IGP who informed him of such went along with it. The current PM is also the minister of finance. So a lot of people will suffer, and BN loses the next GE. You must ask yourself what kind of suffering is bad enough to make Dr Mahathir confident BN will lose next GE. This is typical of the repugnant, avaricious and half breed Mahathir, forgetting that he is no longer the PM, thanks to Allah for that. But one thing for sure all these quarrels must be bad for his heart or should I say very bad for his already very weak heart. Just remember already one of his two feet is already well into the coffin while the other one is on its way into the coffin. His latest comments about blowing up the high way is surely very seditious and also it is a reflection of what the people are paying for next hundred of years to his cronies who built it. Yet nothing happens to him for this utterance and may I add to say that it is a very seditious one indeed. Anyone one else would have being arrested for the utterance or be invited by the police for a cup of tea ! Really the ultimate aim behind all these is the sinister desire to divert peoples' attention from all his ill gotten gains hidden abroad from being probed and with a million dollars reward. Plus another hundred thousand ringgits that I am offering and with a bank guarantee as a starter only. I do not for sure not one of his cronies ! Once again please be reminded that he is no longer the PM and all the supports that he was supposed to have are all vanished years ago. Other wise how come most of the candidates in the past by elections and GE the half breeds campaigned and supported for lost their elections ? Even there was one who won his elections held him responsible for the slim margin he won. Just like a choke who has its throat severed will still struggle around just to show it is still alive. What a hypocrite this 'chap chong' is, it must be the toxicity in his mixed blood that is responsible. like many here, reading outsyedthebox is de riguer. and rocky, i don't think he is crowing. he just tells it as is. and i don't think he is paid. chedet writes it himself. ah jib gor pays people to write it, like lim c*ck wing. wars are not won by paying people to fight for you. so do blogs. haha, 60 minutes to respond to M's blogs. 2 months for 1MDB executives past and present to media visit PAC. Mr. Bru (not the witches, I hope) if I needed a media consultant, I would not pick you. But then agan, you're not a media consultant. Excuse my old mans ramblings. You are a CONFUSED KID!!!! Yesterday this is what you wrote : " Why the hell is PM still talking about 1MDB? "..." I couldn't help slapping my forehead in disbelief: the Prime Minister still thinks he should engage the NGOs and explain to them the state of affairs in 1MDB, even after the #nothing2hide fiasco." Today this is what you have written: " Najib's advisors may want to encourage the PM to consider using his blog to respond directly and swiftly (preferably within 60 minutes) to chedet.cc each and every time Dr Mahathir publishes a new posting." i.e. on 1MDB. It is TOTAL CONTRADICTION of the two articles YOU have penned. You "hangers on" are in such DEEP S*IT, in that you have lost the plot. You just do NOT KNOW how to respond to Dr. Mahathir. All are in a state of CONFUSION. Flying by the seat of your pants. Just reacting, and in utter stupidity. You fellas are a PATHETIC lot. Pontificate in your blogs, about strategy, coherent arguments, blah.. blah..blah.... Plagiarist is what you lot are. Give up lah!! Little wonder the PM is in this mess... poor "advisers' "
Apanama tak ada ke dalam ranking? Mintak ada banyak, kerja tada. Otak ada ka? Najib's camp is trying to spin this to look as if it is a fight between Najib and Mahathir when the real issue is the mismanagement of 1MDB. Najib should stop beating around the bush and start to clearly answer all the questions on 1MDB be it from Mahathir or Tony Pua. rocky, you exemplify the rot within the country. poor strategist, horrible writer and loyalties that are bought. when the most powerful in the country hire you to work with them, they get rubbish. case in point: najib tun razak. at least you paid a few bills in the process. unfortunately here in the real world, the weak ones always get caught out. welcome aboard. What happened to you rocky? I guess being a pro najib blogger has made you look pathetic in trying to find ways to defend your paymaster. Najib is a bloody coward and sukaguam is bloody naive. u all are so over confident to humiliate tun with a managed staged but instead najib that had been humiliated. Najib can go around to pushed for damaged control but the damaged are so bad that no effort could turn it around. Someone please ask Salleh Keruak to talk less and focus on something else. I am afraid he will talk about something that will never be taken back. Okay hes thr speaker and probably thats why he is very brave but he isnt a good thinker. I still remember when Pak Lah was at the helm, you were the number one critic and most of the bloggers take heed of what you said. You are the standard barrier of truth and you're able to rationalize your argument in sync with the feeling of the people on the street. You are the rebel but in a good way where people are yearning for change. Years has passed by since then..You’ve become a household name...However, what become more noticeable as days passes ….. you’ve slowly transformed into becoming part of the establishment. Nowadays you are rubbing shoulders with politicians of your generation, who are your friends who you grew up with…. Your views changed as you do not want to blog against them …...You become less concern in telling the truth but more towards expressing and protecting the views of your so-called friends…. You're in bad need of some good breeding old man charles! Everything is rocky now bru...everything. I can feel the earth moves under my feet...hahah. Isn't that sound rocky to you bru? Lemme be frank with you, ahjib gor is a pondan, bapok who claimed to be a pahlawan 'ball-less'. A chicken without a taji...chicken out every time. A chicken can kokok, until sore throat la. I used word chicken here, man without brain and balls like him is like chicken...can kokok only, no taji to fight. Macam pondan and bapok la. Aiyah .. My english tala standard mah.. I told you before the Razak brothers don't get along. And you replied said they do. There are internal squabbles between the brothers now. No thanks to the wife. She doesn't trust her hubby alone with his own family. Bro you must have had one too many...People in Mecca are "stripped of their riches"...man you must be blind to the Tower of Sauron built next to the Masjid Haram. I suppose it caters for the poor makchiks and pakchiks from the kampung. And you believe that the satan is not there in Mecca...now naive of you. Heck they even have prostitutes there( google prostitutes in Mecca and be surprised). I suppose they are the halal variety. Whats the point in sembahyang, zakat, haji, puasa but then you lie, steal, rob, pillage and plunder.....hypocrisy isn't it.......Munafik is the Arabic word. Never abandon ProNajib blog cause when u need amusement and jokes....there are a lots in those blogs......hehehe.....jangan terhutang budi sampai tergadai body, by the way ProNajib bloggers are are rare breed of smart n creative because the task of keeping the untruth to be the truth. Najib never answers anythg and was never a man with cajones. I am astounded why you are still on his side. Is it because cash is king? Muslim yang kaya? siapa selain Rosmah, Reza? Jho Low tu non muslim. Cammon Rocky, money is not everything. A man is valued by his principle and integrity. So please choose. Khabarnya Najib dah buat majlis penerangan perdana untuk semua ketua penerangan bahagian UMNO dan NGO terpilih seluruh Malaysia semalam. Hebat sungguh sampai seluruh jentera penerangan UMNO dan NGO hendak digunakan bagi menerangkan alkisah 1MDB ini. Persoalannya, kenapa majlis yang sama tidak dibuat semasa 1MDB ditubuhkan? Kenapa majlis gilang gemilang tidak dibuat semasa duit loan dan harta kerajaan dibedak-bedak sesama mereka? Kenapa UMNO tak dijemput untuk kongsi bersama? Kenapa bila dah jadi bala,baru nak libatkan UMNO? Perlu diingat, 1MDB adalah ciptaan Najib dan para punahsihatnya. Hatta menteri-menteri kabinet juga hanya diberi tahu berdasarkan "need to know" sahaja. Jadi, soalan saya adalah kenapa mesti UMNO, menteri kabinet, dan rakyaat Malaysia kena tanggung bala ini? Saya ahli UMNO. Saya tak rela UMNO jadi kuda kayu 1MDB! !